Yesterday at TechCrunch Disrupt, Facebook’s VP of Product Chris Cox announced that the social network would be unveiling a set of “drastically simplified” privacy controls today. Facebook has scheduled a press conference call for 1:30 EST to unveil the new settings, which will be presented by multiple Facebook executives including CEO Mark Zuckerberg. This call comes after a month of serious backlash against Facebook, largely focused around its Instant Personalization feature, default ‘Everyone’ sharing, and its highly confusing privacy control panel. My live notes on the call are below. Zuckerberg: Before we get into the changes we get into the changes we’re doing today. i want to go through how we got to where we are now. I think it’s really easy to lose track of the fact that the service we have today is different from what we had in 2004. As we grow we’ve had to build modern privacy system that can scale. Hasn’t always been smooth. When we went from college only to open to everyone. There was no smooth way to do it. But we’ve tried hard to continually upgrade the system and build a modern system for privacy. Over the last year, one of the big things we looked at was News Feed. In December added per-post privacy. Another thing is applications. We started with simple model for privacy around applications – it was “Allow” or cancel. We saw over time a lot of apps just used basic information about you. Most things didn’t use friends’ photos. We felt this model wasn’t granular enough. Zuckerberg is continuing to walk through the growth of the site — basically how we got here. Issues became particularly difficult with going global, regional networks. Started evolving toward friends, friends of friends, and Everyone (removed regional settings completely). We made a lot of changes at the same time. We didn’t communicate as well as we could have, a lot of it got lost. We really need to simplify controls. We’ve offered granular controls, a lot of people like them. We aren’t taking them away. We holed up a couple weeks ago, got designers/engineers together and built this stuff. Three things – One simple control for all the content you’re sharing. It applies to all content retroactively (good move, FB). Applies to new products going forward. One misperception – when we went through in December we asked people to make everything sharing for everyone. We think that some stuff it does make sense to share with everyone, others like photos we don’t. This is a pretty big overhaul to the system. All the granular controls are still there. For basic directory information – There’s less information that has to be public. We’re removing nuance around connection model, just making it the same as other privacy. Before we didn’t have any privacy control to pages. We added connection model that was too complex. Now you can hide it, even on the Page itself (great news). Setting search as everyone by default, otherwise people won’t be able to find you. Third section is about Platform. Easy to turn off Platform completely. Easy opt out for Instant Personalization. There’s been some concern about Instant Personalization program – it was too confusing to turn it off. Made it so there’s one check box, turn it off. 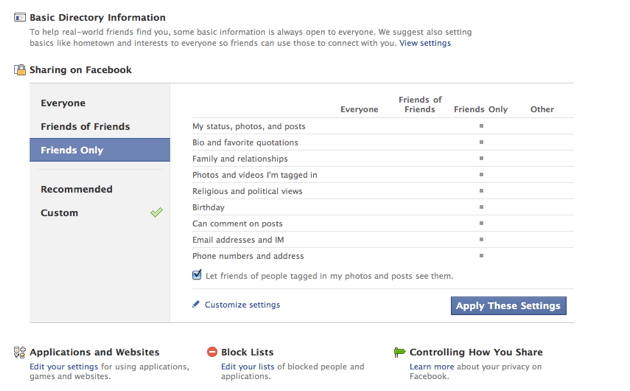 None of your friends will have access to your information either when they use those sites. We want to make sure we communicate this stuff clearly. 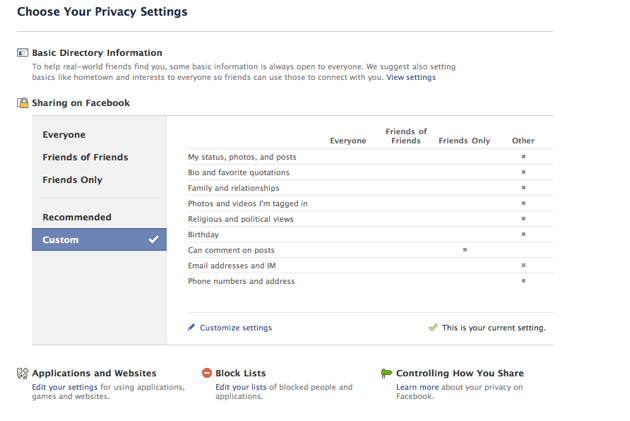 So we’ve revamped the privacy guide (good). 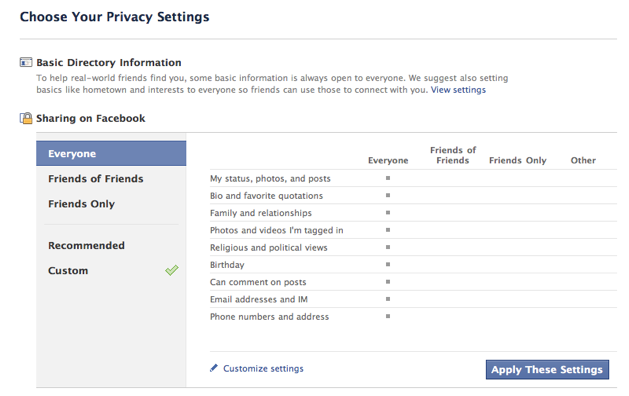 Changed it to update new privacy settings. one thing we’re planning on doing as we roll this out over next days/weeks. Message at top of peoples’ homepage that links to this new guide so people understand what’s going on. We’ve only ever done a few announcements at the top in the history of the company so it’s something that we take seriously. Q: I’m having a problem with trust as FB becomes piece of key Internet infrastructure. I get sense FB changes thing without thinking about trust factor. You’re asking us to trust you in a whole new way. A: At the beginning of my talk I talked about some of our principles. We try to give people control over their information. We try to be innovative and iterative in our development. FB today is so different. We’ve made a lot of changes over time.. the key to how we approach this is that we always listen. Net Promoter score went down for Facebook after f8 — thought it was from privacy, but it was actually a change in News Feed. It seems a lot of people are upset with us after these changes.. I take that very seriously. Q: Can you talk about to what extent law makers played into your decision to make these changes. What inputs did they have if at all? Also your conversation with advertisers/partners. A: We listen to all the feedback we get. We engaged with privacy advocacy organizations. We have had conversations with different folks — senators who had feedback for us. We listened to user back mainly. I think there’s a misperception that we made these changes for advertising. We build great company by serving users first. Misconceptions – Ideas going on that somehow if people are sharing info more openly we can use it better for ad targeting. It’s the opposite. We target ads ourselves. Because of that, it doesn’t matter who you’re sharing info with, be it you friends or everyone. There’s a concept of data portability – FB connect and Platform. People should be able to take info to other services too. That service can use that data to compete with us/ target us. So by doing what we’re doing we’re actually helping other people compete with us in advertising. We think Data portability is good in other ways. But it’s always a debate is how far we can go. 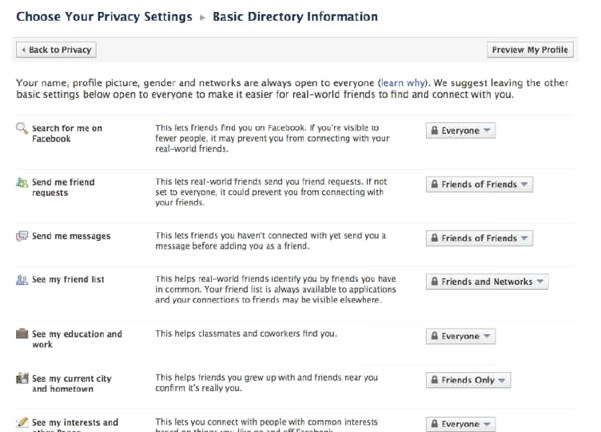 There are models/views in the world that people want info to be as private as possible. I don’t think that’s what users want. We’re sensitive about it. We really do believe in privacy, giving people control. There’s a balance, more and more people want to share information. Q: More context on this outcry vs previous ones. Have there been sig. number of users leaving? A: Every situation is different. We have a lot more people using service now in the past. So News Feed was probably biggest ratio.. 1/10 users back then. People protesting outside of our office. A lot more people are tracking these issues. When you have almost 500 mil using service. If only a few percent are upset that can be a large number of people. Nature ends of being different. A: We’ve done a lot of studies on this to find what’s most understandable to people. The first time you post a status update, a box shows up saying share with everyone, this means everyone on the Internet, with links to change settings. 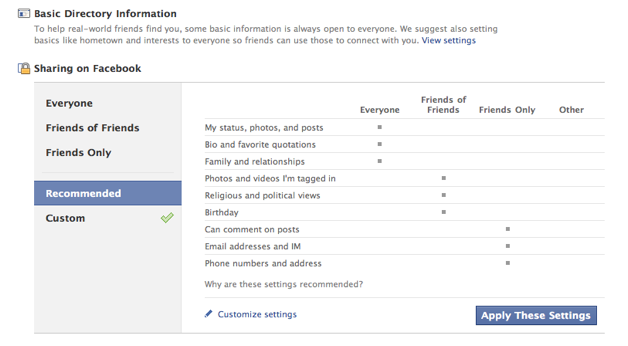 Other piece of info: more than 50% of users on FB have changed one setting. Q: Location. how are you going to prevent a backlash? A: We’re really going to try not to have another backlash. If people say they want their stuff to be visible to friends only, it will apply to that stuff going forward. Not ready to talk about stuff around location because frankly it’s not done yet. Q: You said that people weren’t leaving the site, but were they using it less/differently? A: There was no significant in the way people were using the site. But we got a lot of feedback and agreed with it. 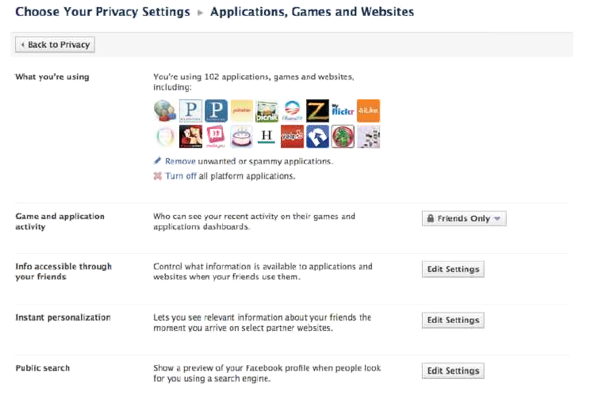 After months of privacy-failing moves, Facebook is finally friending privacy again. Facebook’s about-face on privacy comes as a result of mounting pressure from users and Washington, including ACLU petitions signed by more than 80,000 people demanding that Facebook live up to its principle of user control. While it’s true that users have more control than they did yesterday, there are still important steps that must be taken. We hope that Facebook will learn from this recent round of privacy problems and going forward, will keeps its principles and not just its pocketbook in mind.